Courtesy of he private collection of Lopön Ogyan Tanzin Rinpoche, Senge Dongma, Simhamukha. Bhutanese painting, Shantiniketan 1976. Daki Gyepe Gegyang (Tib. ད་ཀི་དགྱེས་པའི་གད་རྒྱང་, Wyl. 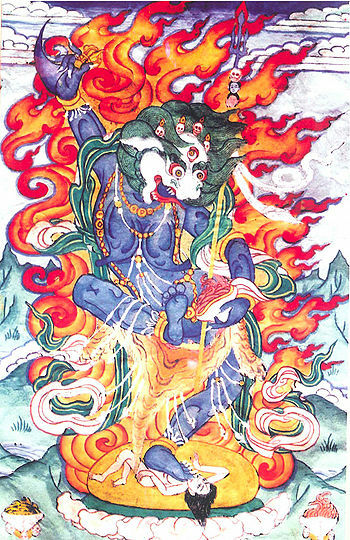 da ki dgyes pa'i gad rgyang), ‘Gladdening Laughter of the Dakini—The Activity Rite of the Terrifying Tamer of Demons, the Fierce Simhamukha’ is a Senge Dongma practice of the Dudjom Tersar lineage. This terma was revealed by Dudjom Lingpa and later edited by Dudjom Rinpoche. I found the practice of Senge Dongma to be a reliable source of protection when obstacles arise. Defilements attract the maras of hindrances and enemies just as a magnet attracts iron filings. When you clear away the negativity of your own poisons, there is nothing to attract the maras. The Daki Gyepe Gegyang is a complete practice which contains three parts: a preliminary (in 8 sections), a main part (in 8 sections) and concluding practices (in 8 sections). Short Daily Practice of Senge Dongma with Hand Clapping (Wyl. seng gdong ma'i thal rdeb rgyung khyer ni), by Dudjom Rinpoche, a widely used daily reversal practice dokpa for Dudjom Tersar tradition followers. Thus, because the yogin Lama Tsewang Lhagyal, who autonomously enjoyed his lot of accomplishments through the path of the quintessential mother tantras of the secret Mantrayana, repeatedly exhorted [me] with great exertion, this “Gladdening Laughter of the Dakini, the activity rite of the terrifying tamer of the demons, the fierce Senge Dongma” has been collated in an order whose procedures are utterly clear and easy to approach, without confusing the intent of the root treasure text. This mantra-holder of the end of time, Jikdral Yeshe Dorje, aged sixty-eight, composed this during the waning period of the moon, in the fourth month of the iron female pig year, at the mountain’s throat on the Mount of Heaped up Kapalas. The assembler of the initial draft if the mantrin’s son Losal Rinchen Phuntsok. This evil contingent of the Chinese army is led by demons of corrupt aspirations. Guru Rinpoche remained in Tibet for 111 years and in his 73rd year there he gave many teachings on the Kagye and also on Senge Dongma. The practice was transmitted to Yeshe Tsogyal, who is an emanation of Senge Dongma, and with her siddhi of infallible memory, she recorded the text in dakini script and concealed it, to be revealed later by tertöns. This particular treasure was revealed by Dudjom Lingpa, and kept secret for 44 years. When Dudjom Lingpa felt it was the right time, he opened the practice, recorded it in human script and transmitted it to others. Dudjom Rinpoche edited the Daki Gyepe Gegyang practice text in 1971, and transmitted many times the “Short Daily Practice of Senge Dongma with Hand Clapping”. ↑ Dudjom Lingpa and Dudjom Rinpoche, ‘Gladdening Laughter of the Dakini, The Activity Rite of the Terrifying Tamer of Demons, the Fierce Simhamukha’, translated by Dylan Esler and Nicholas Chong, Restricted text. Nyingmapa Students' Welfare Committee, Sarnath, India, 2011, Foreword. ↑ Presentation text of empowerments given in Hong-Kong in 2005. ↑ Dudjom Lingpa and Dudjom Rinpoche, ‘Gladdening Laughter of the Dakini, The Activity Rite of the Terrifying Tamer of Demons, the Fierce Simhamukha’, translated by Dylan Esler and Nicholas Chong, Restricted text. Nyingmapa Students' Welfare Committee, Sarnath, India, 2011. ↑ Dudjom Sungbum, volume 12 (na) p.339-349. ↑ Dudjom Sungbum, volume 16, p. 29. ↑ Dudjom Lingpa and Dudjom Rinpoche, ‘Gladdening Laughter of the Dakini, The Activity Rite of the Terrifying Tamer of Demons, the Fierce Simhamukha’, translated by Dylan Esler and Nicholas Chong, Restricted text. Nyingmapa Students' Welfare Committee, Sarnath, India, 2011, page 110. ↑ Dudjom Lingpa, ‘A Clear Mirror’, The Visionary Autobiography of a Tibetan Master’, The Outer Autobiography, translated by Chönyi Drolma, Rangjung Yeshe Publications, 2011, p.192. ↑ Presentation text of a Dudjom Tersar Senge Dongma empowerment given by Jigme Rinpoche in Hong-Kong in 2005. Dudjom Lingpa and Dudjom Rinpoche, Gladdening Laughter of the Dakini, The Activity Rite of the Terrifying Tamer of Demons, the Fierce Simhamukha, translated by Dylan Esler and Nicholas Chong, Restricted text. Nyingmapa Students' Welfare Committee, Sarnath, India, 2011. This page was last edited on 20 February 2018, at 20:41.